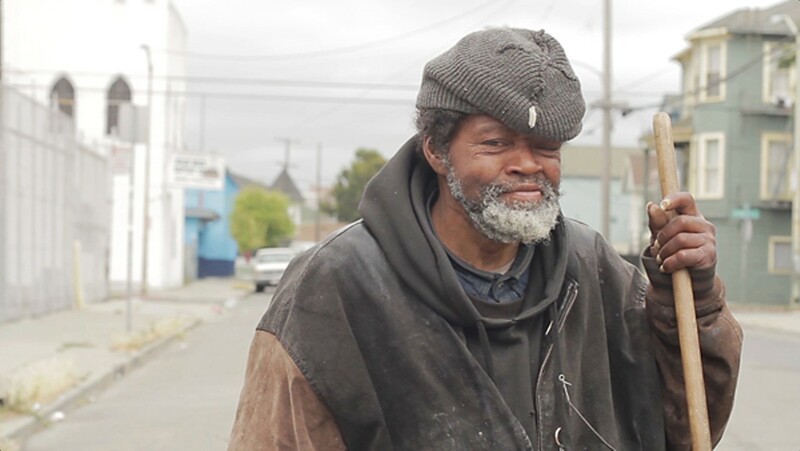 A new storytelling project helps a homeless West Oakland man get off the streets and write his memoir. James Boatner (aka Clean-up) hopes to write a book about how he's survived on the streets. Last April, German filmmaker and raconteur Jonathan Rutsch decided he wanted to create a multimedia storytelling project, but he wasn't sure where to start. His dream was to leverage his global network of artistic friends into a collaborative, cross-cultural endeavor that would bring together street art and video interviews, offering local stories with a global reach. Soon, he and fellow German filmmaker and editor Katharina von Sohlern came up with an idea called Sidewalkstory, a project that would collect "street-level" tales and share them with an international audience. The idea is to paint a stenciled portrait on the street coupled with a QR code so that anyone can scan the code and have a video interview "pop up" on their smartphone. The image is also designed to be downloadable from Sidwalkstory's website so people can print the image and paste it anywhere to spread the story. "Sidewalkstory is about building bridges between people you see every day when you're walking to the subway or the bus station, but you never understand why they're in the streets," said Rutsch. "They may be homeless or refugees or immigrants. And many people are afraid of asking them about it or even talking to them." Oakland artist and teacher Kate DeCiccio, who's friends with Rutsch, was working on a mural last April at San Francisco's Leadership High School with her students and Yescka — a visiting painter from Oaxaca, Mexico — when inspiration for the first Sidewalkstory subject struck. "Yescka came here to Oakland and was really surprised," DeCiccio said. "From the outside, the US is this image of capitalism and consumerism ... and then she got here and the streets are flooded with poor people pushing shopping carts. That dissonance was profound ... and that image of the shopping cart seemed to carry new significance." Rutsch decided that Sidewalkstory would first showcase someone from Oakland, a city that helps depict "the other face of the US," he said — the reality of more than 600,000 homeless nationwide that's so often eclipsed by ubiquitous images of American plenty. 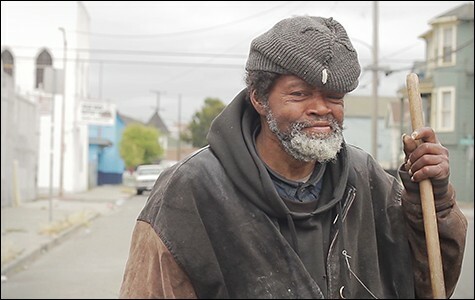 DeCiccio immediately thought of James Boatner, better known as "Clean-up," a gregarious, homeless denizen whose wisdom and dogged dedication to tidying the streets of his neighborhood in West Oakland belied his seemingly hopeless situation. "I knew James," said DeCiccio. "He's super friendly and he had seen some of the other things I've painted in the neighborhood, so I approached him and asked, 'Has anyone ever painted you? Would you be interested in something like that?'" DeCiccio said Boatner was intrigued by having his portrait painted, but was wary about an interview. He wasn't interested in sharing his life with strangers; he wanted to make sure his experiences weren't exploited or squandered. We said, 'Okay, we want to help you. Let us do a video and we can tell the people about your idea and maybe find supporters.'" "One of things about being homeless is that people assume your life is 'public' because you live on the streets and your life is so visible ... but that's not right," added DeCiccio. Rutsch said they essentially "struck a deal" — Boatner agreed to be interviewed for Sidewalkstory if DeCiccio and Rutsch would help rally the financial support to get him off the streets and his stories onto the page. So in September they launched a Kickstarter campaign to get Boatner into housing so he could work on his book. Rutsch said they wanted Boatner to convince people to help him in his own words. The end result is more compelling than anything DeCiccio or Boatner could say on his behalf. "Basically, what's been on my heart and mind is to write a book about how the homeless live ... and it starts with me," Boatner says in his Kickstarter video. "How I have survived ... it takes money to be able to have a place to stay, and I ain't talking about a palace or no castle, just a place that I can be able to sit and think and create my book and tell people how things are. It's not easy." The campaign ended up exceeding its $7,500 goal by $2,598. Meanwhile, a portrait of Boatner — which is at once chaotic and meditative — now resides at 24th and Magnolia streets in West Oakland, but it's also spread to Vancouver, Berlin, Portland, and Mexico. Sidewalkstory allowed Boatner to share his story on his own terms in a medium that reflects his own life. "Street art happens right where you are — you don't have to go to a gallery or a museum to see it — it's happening right in your life," said Rutsch. "Sidewalkstory will not only make his story accessible, but there's a little globalization in there. If the people in Mexico are helping to spread the story of Clean-up ... next time the people from Oakland will spread the tale from people in Mexico." Rutsch laughed when reflecting on how the project has evolved. "The plan was never to collect money for a homeless guy," he said. "We just wanted to do street art together with him. But he's an impressive storyteller. And we don't want to just give him money — we want to get him housing and help him get his idea done." Although the money has been raised, it's not yet in the hands of the organizers. "We got the money from the campaign, but we don't have it yet," DeCiccio explained. "... It takes time from when the money gets raised to being able to actually access it — and explaining how the system works to James has, at times, been a challenge. "I think being so close [to getting off the streets] is energizing him, but the bottom line is he's a senior citizen with really bad feet outside in the cold. We have great faith it's all gonna work out ... just not immediately." DeCiccio said by the time this story is published, however, Boatner should be transitioning into temporary subsidized housing, with something more stable and permanent on the horizon. "Really, the only thing that matters to me right now is getting him inside with his voice recorder, so he can begin strategizing how to get his stories onto the page," said DeCiccio. "I've been thinking about writing a book for a long time," Boatner said in a recent interview. "I hope you enjoy it when it's finished!" A new documentary film, Dogtown Redemption, delves inside the lives of West Oakland's homeless recyclers.